A few weeks ago I made a pit stop in the mostly deserted town of Antelope, Oregon. The town only houses less than 50 people now. This old Antelope Fire Department truck was parked behind the school (which I posted about here), and made a perfect foreground to the pink sunset skies above. Perfect, composition, and everything. Thank you for sharing. The sky reminds me of cotton candy. How cozy to live in a town of 50 people. If still functioning, the school must have very few students. This picture is awesome. We live in the Portland area and love the lush greenery. Where can you live that you go 1 1/2 hours one way and you can be at the beach and the other way and have snow. Love Oregon !!! Visiting from Little by Little. 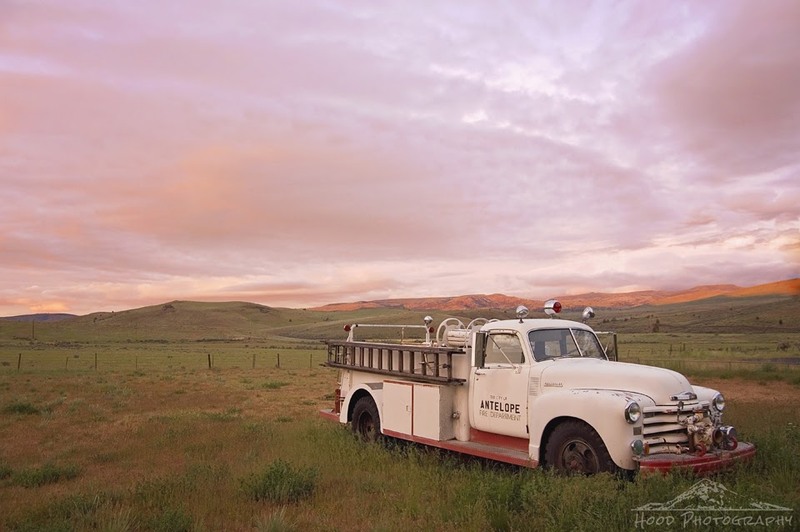 I totally love that old fire truck! Hopefully someone will buy and restore it. Wow - a great composition - a moment in time. Gorgeous colors! it all works so well together.